If you're doing one of our many canoe tours in the Värmland region and would like to experience the very special activity of timber rafting on a raft built with your very own hands but without the commitment of a multi-day tour, Timber Rafting Taster makes the ideal add-on to your trip (see "Possible Canoe Tour Combinations" below). Following instruction, you build your own raft before taking to the water! Photo: John van Helvert. 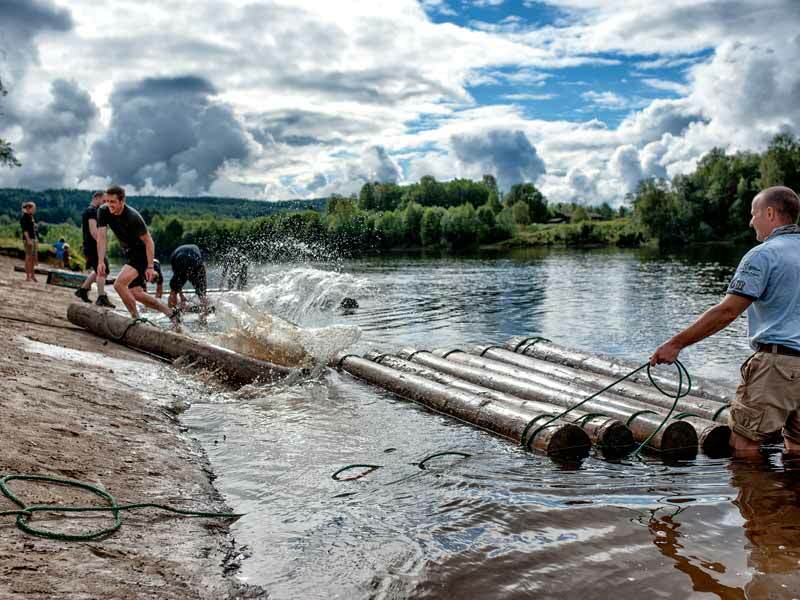 This experience can also be chosen as a stand-alone activity or in combination with one of our cabin options in the area, such as Log Cabin Escape in Värmland or Lakeside Cabin Retreat in Värmland. On Day 1 of your experience, you will build your raft under the guidance of local instructors using nothing but ropes and logs. When ready, your raft will measure 3m x 3m. You moor it to the riverbank before enjoying the evening in camping cabin - maybe take a swim in the river before bedtime! The next morning, it's time to cast off for your timber rafting adventure. You will navigate your raft 10km (approx. 4-5 hours under typical flow conditions) downstream, where you will dismantle it at the end point and release the logs into the log trap. Timber rafting is a great adventure for adults or families. Photo: Frida Edlund. 4-day tour (Sunday-Wednesday or Thursday-Sunday): Can be very conveniently combined with Timber Rafting Taster starting Wednesday or Sunday. Guests combining the tours will do their canoe tour on the northern 50km section of the Klarälven, which ends at the start point for the timber rafting. Plan your canoe tour to finish in time for the start of Timber Rafting Taster at 15.00. 7-day tour (Sunday-Saturday or Thursday-Wednesday): Can be combined with Timber Rafting Taster starting Wednesday or Sunday, but only if travelling by car (no public transport connections available). Your canoe tour ends at the canoe centre approx. 50km downstream of where Timber Rafting Taster starts. For canoe tours Thursday-Wednesday, plan your tour to finish in time to drive to the start point for the timber rafting ready for 15.00. For tours Sunday-Saturday, camp free of charge at the canoe centre on the Saturday night and drive to the start point for the timber rafting for 15.00 the following day. 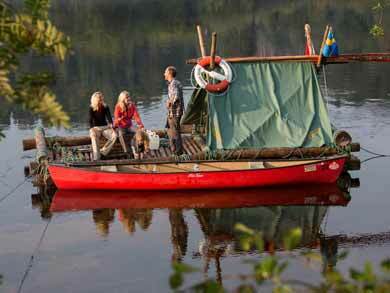 4-day tour (Saturday-Tuesday): Can be combined with Timber Rafting Taster starting Wednesday. Your canoe tour ends with transfer back to the canoe centre approx. 50km downstream of where Timber Rafting Taster starts. Camp free of charge at the canoe centre on Tuesday night and take public bus or drive to the start point for Timber Rafting Taster on Wednesday for start 15.00. Alternatively, take evening bus on Tuesday directly after your canoe tour up to the start point for Timber Rafting Taster and add extra night in camping cabin as an optional extra. 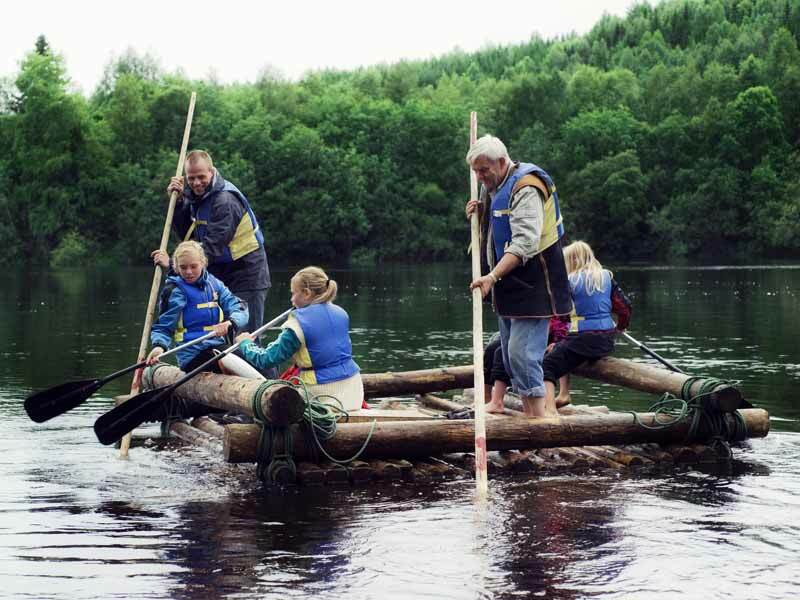 Canoe Tours on Rottnan or Canoe Tours on Röjdån Monday-Thursday: Can be combined with Timber Rafting Taster starting Friday. Overnight in Torsby before taking bus to Timber Rafting Taster the following morning or take afternoon bus from Torsby after your canoe tour and add extra night in camping cabin as optional extra before timber rafting. Detailed information you will need for your experience, including a description of the route, is sent out once full payment has been received. You arrive and check in to your camping cabin from 14.30 onwards. At 15.00 have instruction on the techniques you will need to build your raft and then proceed to build your raft in the water over the rest of the afternoon. Your raft when finished will be 3m x 3m (a smaller raft than the 6m x 3m used on longer timber rafting tour, though building can still take some hours). When ready, you will moor your raft to the riverbank and relax for the evening at your cabin before your rafting the next day. Take a stroll around the local area or into the forest, or simply watch the river go by! Please check out of your cabin by latest 11.00. Having built your raft the evening before, you can choose your own time to set off for the trip - you should plan to reach the end point by latest 17.00. You will be rafting a distance of 10km downstream, which typically takes around 4-5 hours under normal river flow conditions. At the end point, you dismantle the raft and allow the logs to float into the log trap, where they will be collected and reused for a new raft! NB: Please clean your cabin before departure - end cleaning of the cabin is not included. If you wish to add end cleaning, this can be paid for locally, price 400 SEK (about £40). Note also that you will need to take all luggage with you on the raft, as you will not be returning to the camping cabins at the end of the tour. Start days every Wednesday between 5th June and 28th August and also every Friday and Sunday between 3rd July and 25th August 2019 (last start date 28th August). NB: Bed linen and towels for the cabin are not included. If you have your own sleeping bag/sleeping sheet/towel with you, you are welcome to use these for night(s) at the cabin. If not, please request bed linen and towels as optional extras when making your booking. NB: If choosing extra nights in cabin before/after your tour, please note that this must be the same category of cabin (standard or budget) as chosen for your main tour. Canoe: A canoe can be added for your timber raft tour, which is towed behind the raft and can make landing the raft easier. Bed linen and towels: If you have your own sleeping bag/sleeping sheet/towel with you, you are welcome to use these at the cabin. Otherwise, bed linen and towels should be added as an optional extra. Please specify on booking if this is required. Extra night(s): You are welcome to stay extra night(s) at the camping cabins before and/or after your tour in the same standard cabin as chosen for your main tour (Standard or Budget). There are good hiking possibilities in the surrounding area. If adding night(s) at the end of your tour, free transfer can be offered from the end point back to the cabins at agreed time by arrangement. End cleaning of cabin: Guests will normally choose to clean the cabin themselves before departure. If you do not wish to do this, please request end cleaning as optional extra on booking. NB: Please note if combining Timber Rafting Taster with one of our canoe tours, all hired equipment for your canoe tour will be returned at the end of that tour. It is not possible to keep kitchen equipment, etc, for use on the Timber Rafting Taster. You should therefore plan a packed lunch for your timber raft day rather than a lunch which requires cooking. 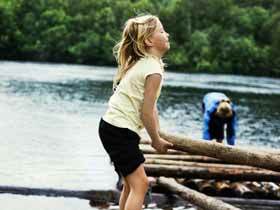 Timber raft equipment: Logs, ropes, life ring, paddle, pole, buoyancy aids, topographical map. A tarpaulin can be offered to cover luggage (you will need to take all luggage with you from the cabin to the end point on the raft) if conditions are likely to be wet. Instructor: Instruction meeting and guidance during construction before your tour begins. Camping cabin: See images below. One night in private camping cabins. Note that bed linen/towels and end cleaning of cabin are not included. Standard cabin sleeps 4-5 persons in two rooms with kitchenette, microwave, fridge, WC/shower and outside porch. Budget cabin sleeps up to 4 persons in one room with bunk beds with kitchenette and small porch. No running water. WC/shower facilities available in separate building (small charge applies for use of showers). Please be careful with your equipment! If some part of the equipment should break as a result of misuse or carelessness, you may be charged for the damage caused. Canoe (available as optional extra). Bedding and towels (available as optional extra). 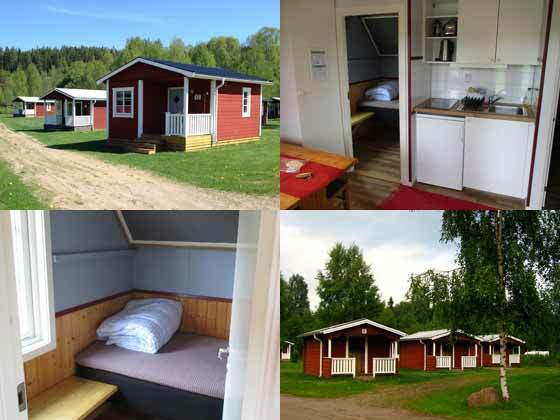 Provisions: The camping cabins have facilities for self-catering. There is a petrol station a few hundred metres from the campsite selling very simple provisions or a grocery store (open until 18.00 on weekdays or 13.00 on Saturdays) approx. 2.2km walk from the campsite. Note that you should plan a packed lunch for your rafting day. End cleaning of camping cabin (available to add as optional extra): Guests will normally choose to clean the cabin themselves before departure, but this can be added if required. Swimming ability required by adults. All participation at own risk. You should be in good health and have a reasonable level of fitness and strength. The raft built will be 3m x 3m, half the size of a raft typically used on a multi-day tour. Building the raft can be physcially challenging, but requires cooperation and teamwork more than strength. As a short tour, Timber Rafting Taster will be less physically demanding than longer timber raft tours. Depending on the level of water in the river, you will still need to negotiate obstacles such as overhanging branches and sandbanks, and be prepared to work to free the raft should it become stuck on an obstacle or in an eddy. A minimum of 2 adults (at least one person 18+ and one 16+) is required for each raft. Recommended minimum age 6 years. As a short tour with smaller raft, this experience will have a lower level of challenge than the standard 5-day or 8-day Timber Rafting on Klarälven tour. However, building and piloting the raft can still be physically challenging. Canoe on Klarälven, Canoe Tours on Svartälven or Canoe Tours on Rottnan/Röjdån: Please see under "Itinerary" for detailed information on combining these canoe tours with Timber Rafting Taster. Timber rafting is ideal for groups. Please contact us to discuss your requirements. You can choose to fly to Stockholm, Gothenburg or Oslo airports. From here, you travel by public transport to Karlstad (around 2.5-5.5 hours depending on options chosen). From Karlstad, you travel by local bus to Värnäs (around 2.5 hours). You can also choose to travel by hire car. Ferry Dover-Dunkirk or Newcastle-Amsterdam for onward connections to Värnäs. Recommended by Lonely Planet magazine as one of its "One-off Weekends". Read Sofia's article on how to build a timber raft on the Nature Travels blog. 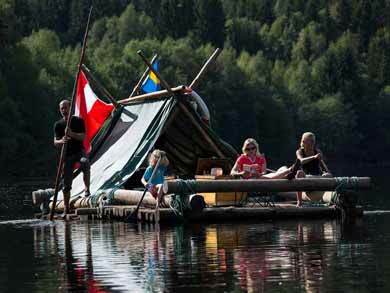 Timber Rafting on Klarälven is the standard version of this tour, with 5-day and 8-day options covering 50km or 100km, and we also offer a 4-day Added Comfort version. 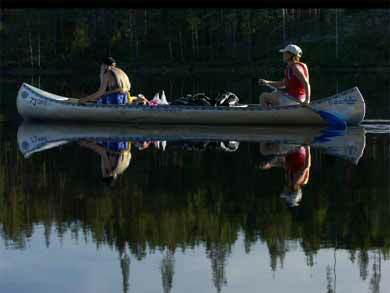 Canoe Tours on Klarälven is an option for canoeing on the same river.